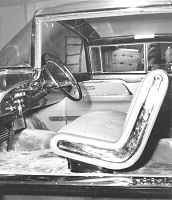 Soon after the excitement of the 1955 Motorama had waned, work began on the Brougham production prototype. 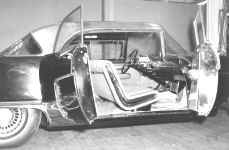 Initially, the car was planned with single headlights and a full-sized car was built. 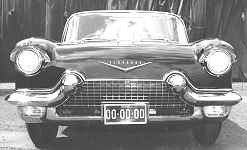 The rare photos, here, of that initial prototype with dual headlights in lieu of the quads that were used on a modified prototype (as well as the production models) are from the exceptional Eldorado Brougham photo collection of my long-time friend, Jean-Michel Roux. On the frontal view, below, top row, right, note the absence of the horn trumpet grilles below the single headlights. In the fall of 1955, the car was almost ready for the trip to Paris. The progress made up to that time was duly recorded by GM styling photographer Mr. Madler on September 12, 1955. The rare photos below also are from Jean-Michel's incredible collection. 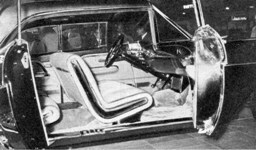 Both the dual and quad head-lighted prototypes - the latter being shown at the 1955 Paris Salon - were non-runners, as was also the Brougham Town Car [see next chapter] shown also in Paris. 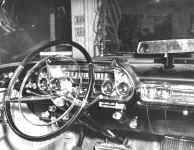 On these cars, for example, the instrument panels were simple wooden forms with dummy instrumenty facias; none of the instruments were wired. 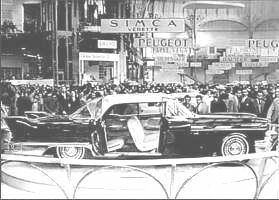 Photos, below, enthralled crowds gathered to admire the prototype Cadillac Eldorado Brougham at the Paris Salon in late 1955. 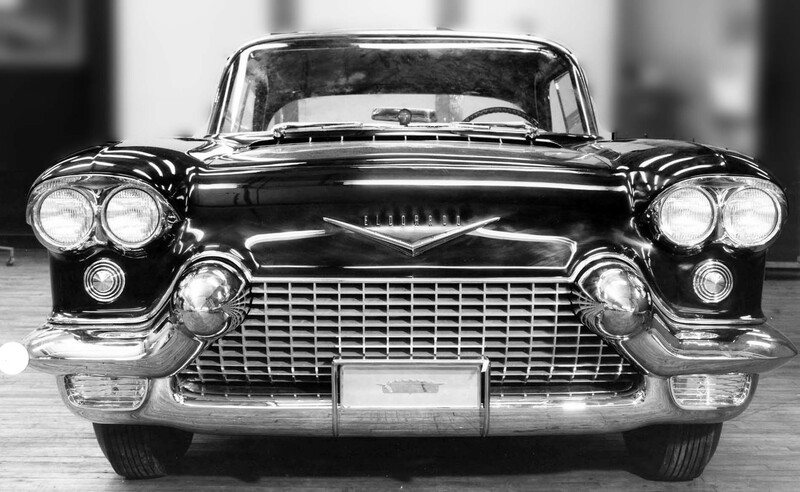 The quad-headlight Brougham prototype returned to the USA, where it was shown at New York - together with the Eldorado Brougham Town Car - in January of 1956. At that time, the prototype was still devoid of the black bumper extension bullets and front fender nameplate [the bright spot on the front fender in the preceding, Paris photos is merely a light reflection]. 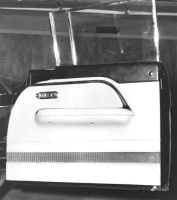 The automatic headlight dimmer [Autronid-Eye] and rear view mirror were still mounted on top and in the center of the dummy dash pad. 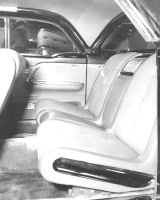 The publicity photos below were taken just after the Brougham prototype returned from Paris. The black "bullet" tips are still missing. 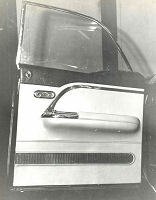 This is how the Brougham prototype looked at the New York show in January 1956. 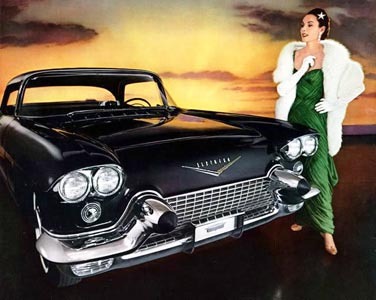 From the second quarter 1956 up to the time the Eldorado Brougham went into production and the first cars came off the line in early 1957, the prototype continued to undergo various styling and trim modifications. For example, the rear-view mirror and automatic headlight dimmer unit were separated. 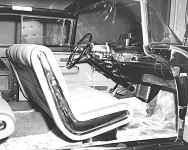 The former was relocated from the top, center of the dummy dash pad to the center of the windshield header bar; the latter took up a new position on the far left of the instrument panel. A more secure door locking mechanism was conceived; it replaced the former, troublesome sill-plate mechanism. 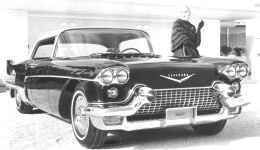 The Brougham prototype was featured in many publicity photographs in the summer of 1956; some of them may be admired here. Thank you, Jean-Michel Roux, for sharing them with us. The penultimate trim modification was the addition of the front fender nameplate. 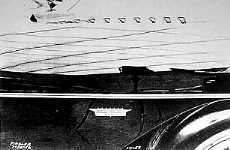 It was put on the front fenders on July 20, 1956. The latter, final touch was duly recorded again by GM styling photographer, Mr. Madler [below is Brougham photo #14159]. 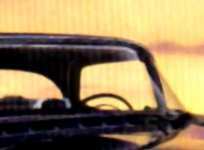 The lighted ceiling of the styling studio is reflected in the upper part of the fender and you can see his camera and his (deformed) tripod in the lower, center part of the image. Still to come was the stainless steel rocker panel trim extending from the rear door to the front wheel opening. This was added at the last minute. 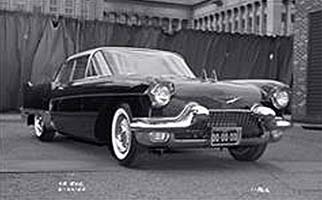 Up to the last minute, also, the prototype retained the custom "sabre-spoke" wheels that had been used on many preceding GM/Cadillac show cars. One of the last factory publicity shots was artfully modified in the design studio to show the car with the correct turbine vane wheels that were to be used on the production models.